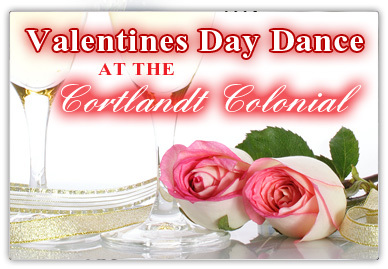 (Saturday, February 13, 2010) The Cortlandt Colonial will again be hosting their annual Valentines Day Dinner & Dance. Unfortunately, since Valentine's Day falls on a Sunday this year, we will be hosting it on Saturday the 13th. The party will feature a Cocktail Hour, a great dinner, and a DJ with Dancing, The restaurant will be serving the regular menu. Reservations are limited for both spaces and are required in advance. Call (914) 739-3900 for more details and to reserve your space.